I've been absolutely obsessed with round bags lately, even though my husband says they look either like canteens if they are small or hatboxes if they are large. Despite my husband's criticisms, the dilemma for me wasn't deciding whether or not to get one but rather which one to get. I finally decided to opt for this black one from Clare V., which is one of my favorite brands because of their fantastic designs and their commitment to making their products in the USA for relatively affordable prices. The bag below is called the petite "Alistair" bag and it also comes in a larger size, which I contemplated getting. (I still might, but in a different color.) 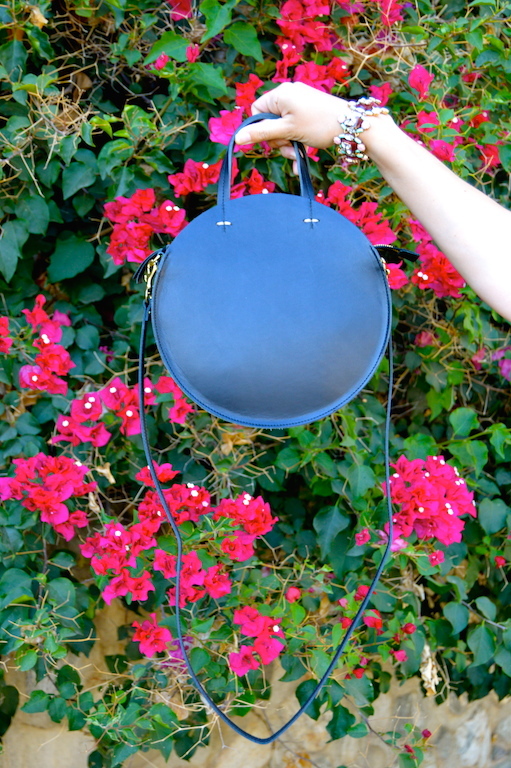 This bag fits all of my belongings and can be worn crossbody, so what more could one ask for? Since the two black bags that I currently own are somewhat dressy and not exactly cheap, this one is perfect because it can be worn casually like how I am wearing it today. I suppose it could be worn if you're somewhat dressed up too. Although I am head over heels in love with this new bag, I've also included a selection of a few other circular bags below. Most likely I'll be adding one or more to my collection in the future! Silly husbands! :) I love the circle bag--and if it fits all your stuff and works cross-body it sounds pretty perfect to me! And here's yet another skirt of yours that I love--such a pretty print! LOVE this look! That skirt with that top... gorgeous! I do like bags that have straps as well as handles so you have the option - as here - to either grab and go or sling over and go! Adorable skirt and so fresh paired with the green top. Love this pretty well-put together look!!! this is such an adorable bag and i love the colors in this outfit! Very chic! I love the bag. it's so adorable! So feminine and chic especially with the addition of the gorgeous circle bag. I like the Clare and the version by Rebecca Minkoff, too. Plus the amazing bag matches the beautiful baroque glasses.